In the process of abrasive waterjet cutting, the focusing tube is a vital component. After all it is in this tube where high pressure water and abrasive are focused to an efficient cutting jet. During this procedure, the physical processes in the tube crucially affect the final speed and precision of the cutting jet as well as the kerf width at the workpiece. 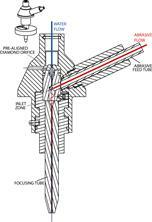 However, which factors influence the functionality of a focusing tube? An important feature of a focusing tube is its length. In combination with the geometry of the inlet zone (see drawing), the tube length significantly determines the speed and focus of the exiting jet. The pure water jet created by a diamond or sapphire orifice (see Tech NEWS I/2012) is enhanced with abrasive sand in the mixing chamber, which is in front of the focusing tube. In this process, both a correct inlet angle and a minimum tube length are necessary to adjust the abrasive particles to the velocity and direction of the waterjet thus creating a precisely focused and efficient cutting jet. However, the focusing tube should not be too long either as the jet will then be slowed down due to friction at the inner surface and decrease in cutting performance. Considering the general interaction of focusing tube and water orifice, there are also some things to take into account. For example, the proportion of the respective interior diameters is important for the precise focus of the cutting jet. Moreover, tube and orifice have to be exactly aligned. Normally, a concentric, slightly wavelike wear can be observed, especially at the tube inlet. If the alignment is imprecise, the wear increases and affects the jet’s quality after a shorter period of use. This may result in a diversion of the cutting jet at the tube outlet and a deterioration of the cut quality at the workpiece. Further factors which particularly influence the product life are the inlet velocity of the waterjet as well as the amount and quality of the abrasive and of course the material quality of the focusing tube. Taking all of these features into account, the focusing tube HYPERTUBE by KMT is first choice for many operators of waterjet cutting machines. Starting with the choice of material, KMT offers different quality levels which enable a product life of up to 120 hours – possibly even more depending on application. 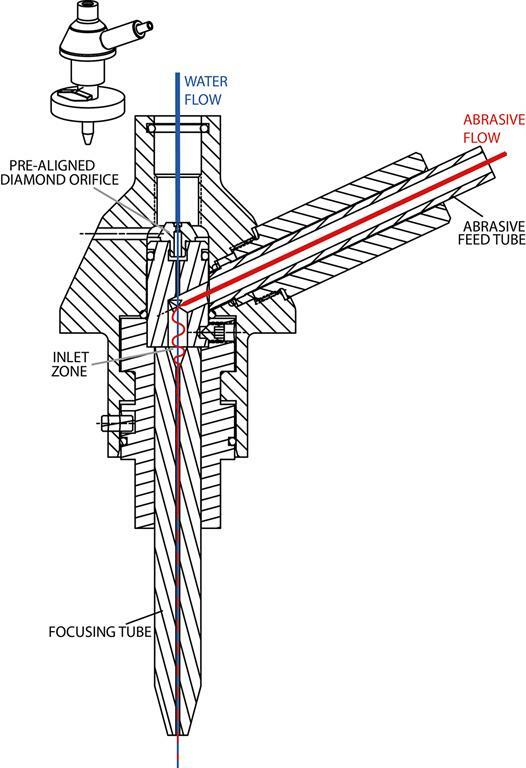 Considering that a long-lived focusing tube makes for a precise cut which lasts over an equally long period, a high quality tube may reduce the downtime of the whole machine. Furthermore, KMT has optimized the tube’s geometry and material with over 40 years of experience to accomplish the best possible cutting performance. 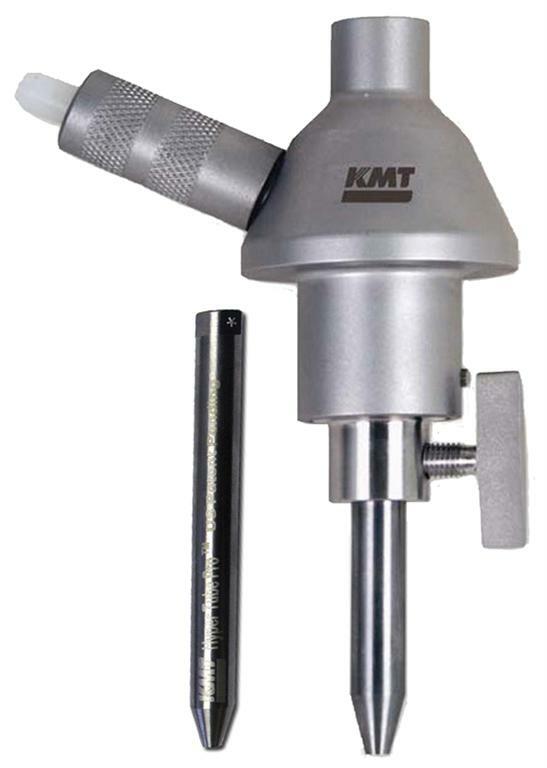 The combination of the HYPERTUBE and a KMT cutting head guarantees an exact alignment of focusing tube and water orifice as well as the right proportion of the respective interior diameter – KMT’s advice is a proportion of approx. 1:3. Moreover, the great exterior diameters resulting in a high wall thickness realizes a very good heat dissipation. In late June, 2012, the KMT Waterjet moved its Headquarters for Europe, Africa, Middle East and India into a bigger building. This step became necessary because the company has continuously increased the number of employees within the last few years. Therefore, the existing premises did not suffice anymore. The departments Service and Contract Cutting remain at the former location. Due to a stable growth within the last three years, KMT could extend the workforce in all departments – on the one hand to open up new tasks, on the other to optimize existing ones. When the floor space at the former location of the European headquarters was maxed out, the company decided on moving to more generous premises. Luckily though, the new and the old location are merely 50 m apart – good for KMT as the departments Service and Contract Cutting remained in the former buildings thus being able to extended their capacity by using the now empty floor space. So in spite of the different addresses, the efficient teamwork among the KMT employees will continue. KMT customers may even take advantage of the relocation. At the old address, the departments Administration and Sales were located in different buildings. As this has changed, the in-house communication could be facilitated leading to an optimized cooperation of the employees and thus a more efficient processing of customer requests. In addition to the Administration, the warehouse has been moved, too. Here, the greater floor space enables an optimization of warehousing and internal lead times. Moreover, KMT could recently obtain the AOE-Certificate and the status as authorized economic operator (click here for details). The respective customs benefits further accelerate the shipping process and contribute to a quick delivery of necessary spare parts. As regards the departments Service and Contract Cutting, there is another advantage resulting from the warehouse relocation. Since these departments are still located in the old building, they can access to the former storage areas. KMT will use this opportunity to give the technicians more space for carrying out modifications at the high pressure pumps. This again leads to shorter reaction times concerning customer requests.